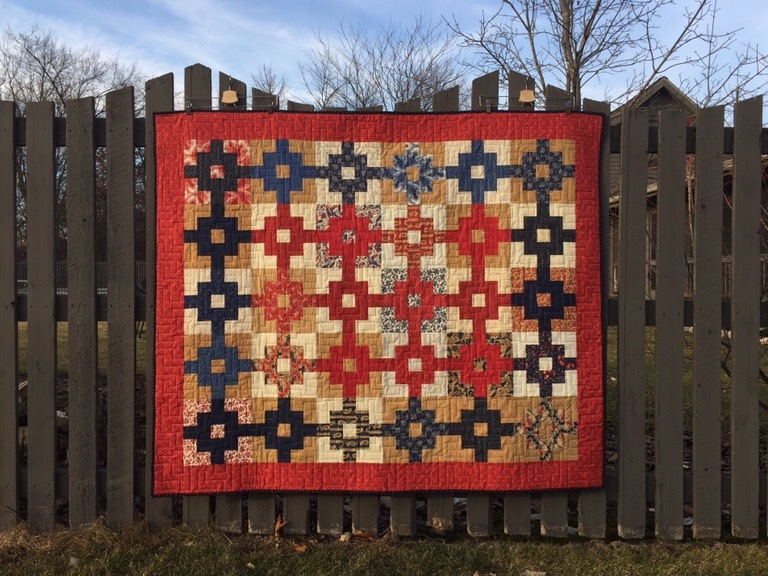 I finished up another Quilt of Valor last week. This was made from a Minnick and Simpson jelly roll from their Polka Dots and Paisleys line. The block pattern was free on he Moda Bake Shop site and it is called Tropical Punch. Not very tropical here, but I liked the pattern! I used a pantograph called Techno for the quilting. It is available from Digi-Tech. Here are a couple shots taken after washing. 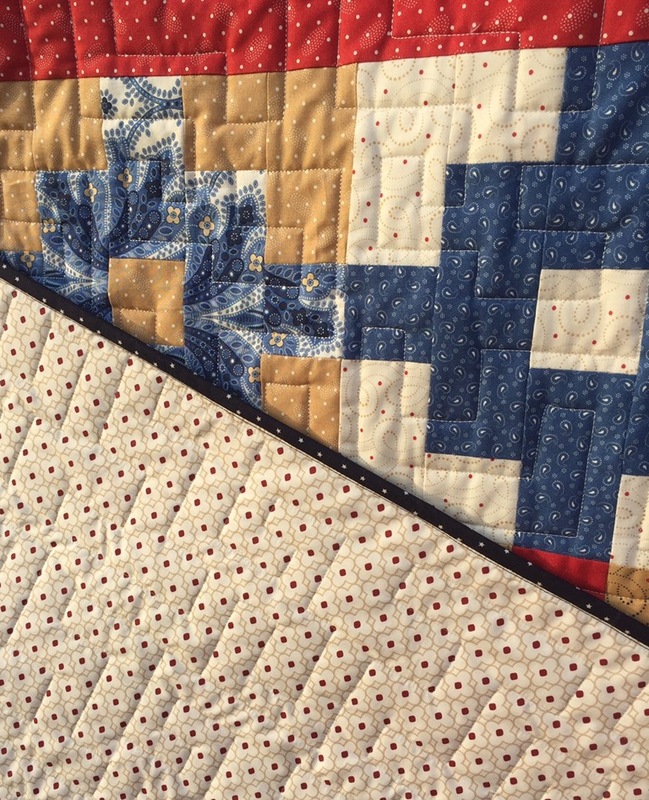 The top looks great, and I like the way the quilting extends into the border, too. Very nice. Thank you for sharing your talents with one who served. That one is really cool! 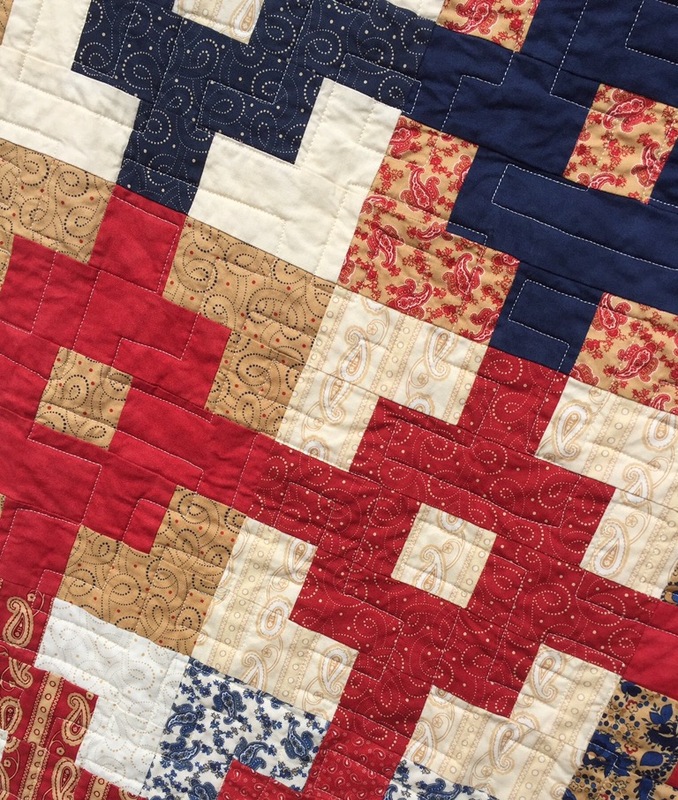 Love the quilting you did too! This is a great one, Katy! Love the fabrics, pattern, and quilting, as well! In other words, I love this quilt!! Thanks for sharing! Love your quilt. Perfect fabrics for a QOV quilt. I LOVE the pattern and your quilting. And I agree with Louise; I really like the red blocks in the center surrounded by blue. Great job! This is a nice one. I really love the Quilts of Valor program, and one of the best nights of my life was getting to participate in a banquet where a whole returning injury unit was awarded quilts. I was overwhelmed with their gratitude. This one is going to be loved! I loved it, too, when you showed those first few blocks and had to start one of my own!! I’ve gotten 8 blocks done and several more cut but am hip deep in helping my son move into his new house (have to go wait for the pod to arrive today). But will get back to them VERY soon!! Yours is gorgeous! I like the fabrics in this line, and they work great for a QOV. Lovely work, as usual, Katy! Have a wonderful weekend! 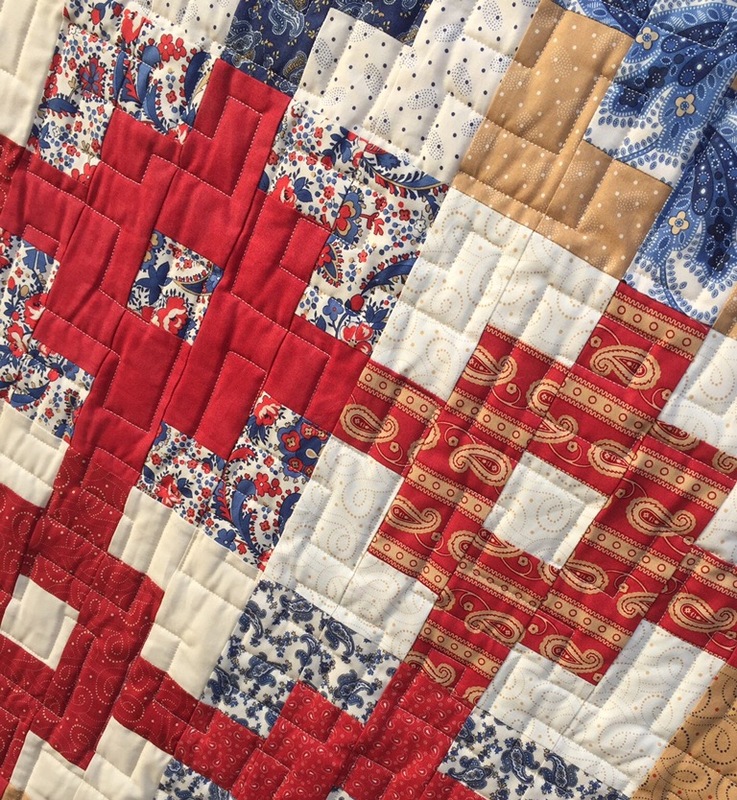 Beautiful quilt and really interesting quilting! It works well with the design! I really like this quilt! It looks even better in these colors than in the tropical ones. Lots of great contrast, and the way you put the reddish blocks in the middle with the blue ones surrounding works so well. 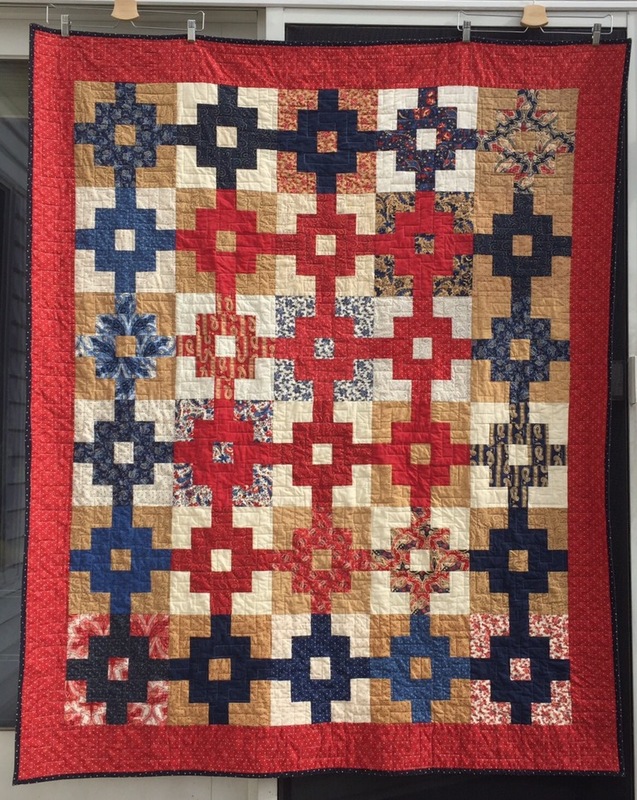 Great finish on a fun quilt! Love that pattern and panto! A Veteran is going to feel all the love that went into that. Fabulous! 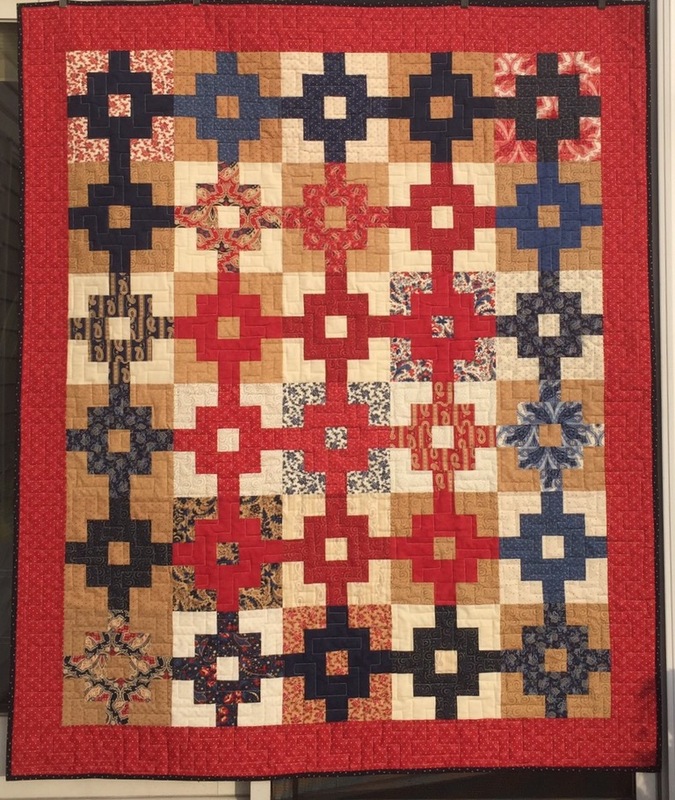 What a great pattern for a QOV quilt. Very pretty! I also wash my quilts before giving them away. I love the scrunchy softness of a washed quilt. Wonderful, love the fabrics, the pattern and the quilting !